Our Ottoman theme takes center stage as we highlight the current exhibition at The Textile Museum in Washington, DC, featuring over fifty embroidered textiles spanning the late 16th to early 20th centuries. As the Ottoman Empire flourished so too did its decorative arts. The textiles produced during the Ottoman reign provide a window onto the opulent culture which produced them. By exploring Ottoman cultural traditions we can better understand how social changes, environment and economy influenced textile production and design style. Floral imagery is ubiquitous in the embroidery of the Ottomans and pays homage to their love of flowers. On view is a veritable garden of stitched tulips, carnations, hyacinths, pomegranates and arched floral branches which replicate the splendor of Ottoman gardens. Like a long buried treasure now brought to light, many of these embroideries have never before been displayed or published. Late 18th or Early 19th Cent. Textiles of all kinds played a pivotal role, influencing many aspects of Ottoman ceremonial and day-to-day life. At the top of the hierarchy were the needlework designs of the Nakkashane, the royal design atelier. Draftsmen copied these patterns for distribution to a populace anxious to emulate palace styles. Eventually they found their way to the far reaches of the vast Ottoman Empire, where the designs were employed not only by textile artists but also by potters, painters and others. As trade routes were firmly established with Western Europe in the early 18th century, a blending of the exotic Ottoman designs with the exuberant style of European Rococo took place culminating in the unique aesthetic known as Turkish Rococo. The Nakkashane attracted the brightest lights in the design world of the times, bringing a vast pool of talent together at the Topkapi Palace in Istanbul. Here influences from the numerous cultures which the Ottoman Empire encompassed were blended resulting in a distinctive style. Decorative textiles defined an individual's status both at court and in society at large. They were made into garments, wrappings, ornaments, covers, household furnishings, wall hangings, room dividers and daily linens. Some were further enhanced with gilded threads, sequins, gems and semi-precious stones. More extravagantly embellished textiles were inextricably linked with ceremonial life and family celebrations, such as weddings, births and circumcisions. Apparel, accessories and footwear for these events projected an aura of luxury, created as they were with luscious silks and sparkling metallic threads. The Imperial city of Istanbul was the seat of power of the vast Ottoman Empire and also the center for trade. The bazaars within this culturally diverse city were renowned for textiles, embroidered by both men and women. The men labored primarily in urban workshops producing large works from heavy materials and integrating them with the more costly materials of pearls, gold, precious and semi-precious stones. Since social custom restricted women to their homes, they occupied themselves with needlework in the haremliks (women's quarters). Embroidery was considered a suitable pastime for women and training in the needlearts formed an integral part of a young girl's upbringing. Women were equally adept in stitchwork as their male counterparts, were allowed to earn an income from their labors and to furnish their own homes. Handmade textiles were furthermore an indication of the wealth and status of a woman's family and reflected her skill as a needleworker. The interior of a typical Ottoman home consisted of both haremlik/harem (women's quarters) and selamnik (men's quarters). The main rooms of the haremlik were surrounded on three sides by divans scattered with cushions. Pillows and other textiles were colorfully embroidered with gold and silk threads depicting floral motifs emulating a garden indoors. Floors covered with mats and carpets were also littered with cushions to provide seating. The largest embroidered textiles were covers and wall hangings. Bedding consisted of mattresses, covers and pillows which were placed on the divans and floor at night. Upon awakening, these were rolled up and put away in storage spaces covered by embroidered hangings. Company was always welcome in the Ottoman home as it was thought that each guest was a "guest from God," and was treated accordingly. Visitors also provided the women with a festive respite from their seclusion and daily chores. The guest was shown into the best room of the haremlik. 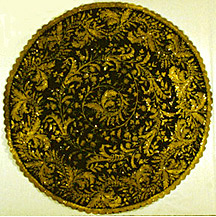 A round cover was spread on the floor which sometimes functioned as a table. At other times a cylindrical stand was placed on top of the spread which was then covered with a matching cloth and a lavish food tray placed on top. The coffee service is a custom which originated during the Ottoman Empire and persists in Turkey to this day. The prevailing belief was that if a guest was served a cup of coffee, he would pray for his host for 40 years. The coffee ceremony was highly ritualized and was conducted by at least 2 or 3 young girls or boys. Guests were presented with embroidered yagliks (napkins) or towels for wiping their hands while partaking of the refreshments. The bohca, a square cloth made in different sizes, was used to wrap things to be either carried or stored. As embroidered textiles were symbols of status and bohcas were often used in public, great care was taken to make them beautiful. Women employed them to carry towels to the hamam (bathhouse) or to protect the bride's trousseau in transferring it to her new home. Going to the hamam was a favorite pastime for the otherwise secluded Ottoman women and constituted a festive and ceremonial outing. It offered a place where women and girls could show off their embroideries, their bath nalins (raised wooden clogs) and jewelry. It also provided the opportunity for mothers to select future brides for their sons. The quality of a prospective bride's needlework, which reflected both her family's wealth and her own skill, would certainly be factored in by a matchmaker. The most important occasion in an Ottoman woman's life was her wedding, and preparations were begun early in a girl's life. From the time of a girl's birth, the older women would begin working on her ceyiz (trousseau) and the child would join in as soon as she was old enough to hold a needle. Her ceyiz was made up of yagliks, bath towels, covers, bohcas, apparel, accessories and all sorts of other items for her future home. For days before her marriage, relatives and friends would decorate her new home with these articles. Brought wrapped in elaborate bohcas, they would be spread out in order to view their overall artistic impact. Yagliks, towels, dresses, scarves and sashes would be hung on the walls. After the wedding ceremony the bride would go to her new home dressed a magnificent bindalli (dress), veil and slippers. Surrounded by her ceyiz, she was presented to her guests who would scrutinize her handwork and evaluate her stitching skills. Concurrently, festivities involving the groom were taking place in the selamliks which included the ritual of cutting the groom's hair. Seated, he would don a ceremonial apron and towel (barber's set) used for the occasion. Under the watchful gaze of the bridegroom's relatives and friends, the barber would do his work while musicians played and sang. One such set on display is exquisitely embroidered with intertwined trees. The trees may symbolize the ritual joining of the married pair, coupled with the tree of life representing fertility and fruitfulness. The basic tools used for embroidery were the gergef, a rectangular embroidery frame standing on 4 short legs and needles made from metal, bone or tusk. Sometimes the gergef itself was exquisitely carved and inlaid with mother-of-pearl. 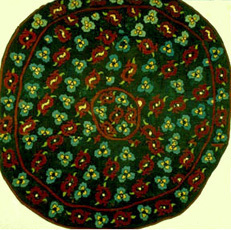 A secondary frame also used for embroidery was a round hoop called a kasnak. Most embroidered textiles were executed on a very loosely woven plain weave ground fabric most often made of cotton or flax. More elaborate work was done on silk satin weaves or cotton velvets. The stitches employed were of two types - reversible and non-reversible. As the name implies, reversible stitches appeared almost identical on both sides of the fabric. Ottoman embroidery techniques were such that they prevented irregularities and resulted in very uniform stitching. The royal embroiderers were exceptional in their ability to create extremely diverse effects by manipulating stitches for effect, as well as being masters at incorporating metallic threads for further enhancement. Throughout the late 18th and early 19th century, the use of metallic threads was so prevalent that certain textiles were embellished almost exclusively with them. Metal wire spirals (tirtil), sequins and pearls were often added to highlight the designs. Prior to embroidering, the artist would transfer the design by drawing it directly on the fabric with a brush or inking pen, tracing it with charcoal or by using templates or print blocks. Ottoman embroidery from the 17th to 18th century is characterized by compositions with very precisely detailed motifs in clear forms. These had a defined orientation and were executed in a small number of bold colors (red, blue, green, yellow, white and black). Designs made up one or two motifs were placed on a diagonal or straight alignment and were sometimes combined with a lattice pattern to form large, free-flowing patterns. During the 19th century designs began to lean toward more intricate and realistic floral motifs. Ottoman decorative arts became even more lavish and detailed with the increased influx of European influences brought about by trade with the West. The Textile Museum was founded in 1925 by George Hewitt Myers with a collection of 275 rugs and 60 related textiles. Myers first became fascinated with textiles in college when he purchased an Oriental rug for his dormitory room. Over the years, his collecting tastes broadened and he continued to collect avidly until his death in 1957. By then his collection had expanded to encompass the textile arts of Africa, Asia and Latin America. George Hewitt Myers' discriminating eye and cosmopolitan tastes laid the foundation of The Textile Museum's unparalleled collection, which consists of over 16,000 objects spanning 5000 years. The Museum is committed to exploring the extraordinary role which textiles have played in the history and cultures of the world in order to further the understanding of mankind's creative achievements in this field. It functions as a center of excellence for the research, conservation, interpretation and exhibition of textiles, with an emphasis on the artistic, technical and cultural significance of its collections. Flowers of Silk and Gold - Four Centuries of Ottoman Embroidery was curated by Sumru Belger Krody, Associate Curator, Eastern Hemisphere Collections, The Textile Museum. All images and textual information for this feature story have very generously been provided by The Textile Museum. Special thanks are extended to all personnel at The Textile Museum who made this presentation possible. COPYRIGHT NOTICE: No part of this feature story nor the included designs can be reproduced or distributed in any form (including electronic) or used as a teaching tool without the prior written permission of the CARON Collection Ltd. or the featured designers or contributors.